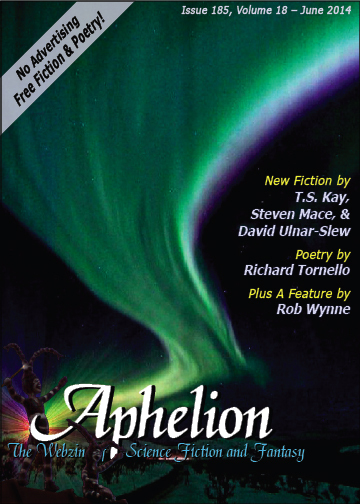 Aphelion • View topic - The June issue is now live! The June issue is now live! Re: The June issue is now live! Yeah right? I got sick of being the eager beaver who always floods the forum with posts on day 1 and 2 of a new issue so I held back. IS there no one other than me who sits around waiting for the first Sunday of the month? Post people!!!!!!! Well Im must say, having the issue out on the first of the month is surprising, but magnificently appreciated. Semi-regular participants may take awhile to know this, who are use to checking in on the third week of each month. Our new schedule is the first Sunday of the month, and I believe it's at least 4 months in a row we've been on time. Good for us, but a little embarrassing when compared to other magazines. I really like the cover art for this issue. What poem, Ayaz? I see nothing here attributed to you. Speak up, or I'll delete you. Wesson wrote: I really like the cover art for this issue. Oops . . . too late. Sorry, Daryl, but I had no way to know.